When the pressure frame arises only after the 20th week of pregnancy in a woman who was not previously hypertensive, we ranked it as gestational hypertension. Once it occurs, gestational hypertension often remain for the rest of the pregnancy, but tends to disappear within the first 12 weeks after delivery. In this article we address the hypertension in pregnancy, explaining the differences between chronic hypertension in pregnant, gestational hypertension and preeclampsia. We'll also talk about the treatment of hypertension in pregnant women and the risk to the baby. 1. Preexisting chronic hypertension - patients with blood pressure values often above 140/90 mm Hg is considered hypertensive. In pregnancy, it is considered pre-existing hypertension hypertension all that existed before the woman becomes pregnant. As expected, women who are hypertensive before pregnancy, continue to be hypertensive throughout pregnancy. Hypertension is also considered pre-existing if it is identified before the 20th week of gestation. When a woman discovers she is hypertensive before 20 weeks is because it was already hypertensive before pregnancy and just did not know. 2. Pre-eclampsia - it is the emergence of hypertension after 20 weeks of pregnancy associated with loss of protein in the urine, a situation that is called proteinuria. A hypertension that arises after the 20th week of pregnancy and is associated with kidney problems, liver, central nervous system or fall in the number of platelets can also be pre-eclampsia. 3. Pre-eclampsia superimposed on chronic hypertension - is preeclampsia occurring in previously hypertensive women. 4. Estational hypertension - is considered gestational hypertension that arises only after the 20th week of pregnancy and which shows no loss of protein in the urine, or any other suggestive manifestation of preeclampsia. In this article we will stick to gestational hypertension, which is a form of hypertension caused by pregnancy. As just explained, gestational hypertension is a form of hypertension that arises after the 20th week of pregnancy in previously healthy women and it shows no sign of preeclampsia. Although this form of hypertension can appear from the 20th week of pregnancy, the vast majority of cases arises only at the very end of pregnancy, since the third quarter. Gestational hypertension is an exclusive hypertension of pregnancy, fading, in most instances spontaneously within 1 or 2 weeks after birth. Up to 12 weeks postpartum hypertension does not disappear, the patient is now considered as having chronic hypertension. The non-spontaneous resolution of hypertension occurs in about 15% of cases. Gestational hypertension is a risk factor for the future development of hypertension. Even women who showed normalization of blood pressure after delivery end in the long run, with four times more likely to develop chronic hypertension. Pregnant women of black race. Pregnant women older than 35 years. Family history or preeclampsia personnel. Gestational hypertension is a far less serious problem that pre-eclampsia, but still it can bring harm to the pregnant and the baby. Hypertensive pregnant women at increased risk of changes in blood flow in the placenta, fetal growth restriction, placental abruption and premature delivery. Complications are more common in women who have severe gestational hypertension, characterized by blood pressure levels of 160/110 mmHg persistently above. Among pregnant women who initially present with criteria for gestational hypertension, around 1/3 ultimately evolve to take criteria of preeclampsia, which is a much more severe forms of hypertension. 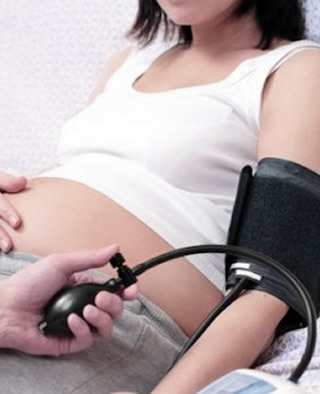 Therefore, all pregnant women with gestational hypertension should be carefully observed during pregnancy, with frequent surveys of proteinuria by urine test. We do not know if gestational hypertension and preeclampsia are two separate diseases or just different clinical spectrum of the same disease. Onset of hypertension before 34 weeks of gestation. Changes in the flow of uterine artery detectable by ultrasound with doppler. High levels of uric acid. Many of the medications commonly used to treat hypertension are contraindicated in pregnancy, which makes the control of blood pressure during pregnancy a more complicated task. Moreover, the safety margin is smaller, since besides the desired reduction of blood pressure may cause severe reduction of blood flow to the placenta, bringing harm to the fetus. Therefore, except in severe cases, obstetricians usually choose not to treat with medication high blood pressure during pregnancy. The treatment of hypertensive pregnant depends on the degree of hypertension. a) Lower blood pressure 160/110 mmHg - Non-severe gestational hypertension. Most women with gestational hypertension shows levels of blood pressure below 160 mm Hg / 110 mm Hg may be accompanied by weekly or biweekly visits to measure blood pressure, protein excretion in the urine. The patient should also be advised to check your blood pressure daily at home. The purpose of such frequent consultations is to identify early any sign of progression to pre-eclampsia. Patients should be informed about the signs and symptoms of severity, such as headache, vision changes, abdominal pain, decreased fetal movement or vaginal bleeding. In non-severe gestational hypertension, pregnant do not have to stay home in bed, but indicated a reduction in the day-to-day. Physical exercise should be avoided and if the professional work is too stressful or strenuous, it is best to walk away. Scientific studies show us that treating blood pressure in non-severe gestational hypertension no benefit either to the mother or the fetus, and may cause undesirable side effects. So if the mother does not present blood pressure values above 160/110 mmHg, no need to start any anti-hypertensive drug. Childbirth in gestational hypertension is usually performed between the 37th and 39th weeks of pregnancy, according to the clinical condition of the mother and the fetus. b) Higher blood pressure 160/110 mmHg - Severe gestational hypertension. Women who develop severe gestational hypertension have rates of complications similar to those of pre-eclampsia, and thus should be treated similarly. Severe gestational hypertension needs to be treated with antihypertensive medications and birth is usually performed between 34 and 36 weeks of pregnancy. If the mother is under 34 weeks, hospitalization for control and monitoring of the fetus and blood pressure is usually indicated. The aim in such cases is to attempt to bring safely pregnancy until at least 34 weeks. The most commonly used drugs to control blood pressure are methyldopa, Hydralazine, Nifedipine and Labetalol.